Minimizing exposure to pollens can stop the runny noses and sneezing suffered by millions of people with pollen allergies. Symptoms of these allergies to tree, grass and weed pollens, also known as hay fever, can be lessened with over-the-counter and prescribed medications. Protecting your home against pollen infiltration also can help, especially during those times of year when pollen can be more prevalent. At Allergy Be Gone, we carry air conditioners and vacuum cleaners by leading manufacturers with high-efficiency particulate air, or HEPA, air filters that can filter out pollens. Our line of premium-brand window filters and screens can let in fresh air while helping keep out unwanted pollen. These screens can also be used in winter to prevent "sick building" syndrome. We also carry air filtration systems for the interior of your car. Also shop our line of irritant-free cleaning products for your home, vehicle and office. Our line of lightweight allergy face masks is popular with gardeners and others who want to reduce pollen intake while they are outdoors. Free-floating pollen particles are easy to inhale, without even knowing it. In people who are not allergic to pollen, the mucus in the nasal passages simply moves these foreign particles to the throat, where they are swallowed or coughed out. But something different happens to a pollen-sensitive person. As soon as the allergy-causing pollen lands on the mucous membranes of the nose, a chain reaction occurs that leads special cells in these tissues (called mast cells) to release histamine. This powerful chemical dilates the many small blood vessels in the nose. Fluids escape through these expanded vessel walls, which causes the nasal passages to swell and results in nasal congestion. Histamine can also cause itching, irritation, and excess mucus production. Some people with pollen allergy can develop asthma, a serious respiratory condition. While asthma may recur each year during pollen season, it can eventually become chronic. The symptoms of asthma include coughing, wheezing, shortness of breath due to a narrowing of the bronchial passages, and excess mucus production. Asthma can be disabling and can sometimes be fatal. If wheezing and shortness of breath accompany the hay fever symptoms, it is a signal that the bronchial tubes also have become involved, indicating the need for medical attention. Plants produce the microscopic round or oval grains called pollen in order to reproduce. The types of pollen that most commonly cause allergic reactions are produced by the plain-looking plants (trees, grasses, and weeds) that do not have showy flowers. These plants manufacture small, light, dry pollen granules that are custom-made for wind transport; for example, samples of ragweed pollen have been collected 400 miles out at sea and 2 miles high in the air. Most allergenic (allergy-producing) pollen comes from plants that produce it in huge quantities - a single ragweed plant can generate a million grains of pollen a day. The chemical makeup of pollen is the basic factor that determines whether a particular type is likely to cause hay fever. For example, pine tree pollen is produced in large amounts by a common tree, which would make it a good candidate for causing an allergy. However, the chemical composition of pine pollen appears to make it less allergenic than other types. Among North American plants, weeds are the most prolific producers of allergenic pollen. Ragweed is the major culprit, but others of importance are sagebrush, redroot pigweed, lamb's quarters, Russian thistle (tumbleweed), and English plantain. Grasses and trees, too, are important sources of allergenic pollens. Although there are more than 1,000 species of grass in North America, only a few produce highly allergenic pollen. These include timothy grass, Kentucky bluegrass, Johnson grass, Bermuda grass, redtop grass, orchard grass, and sweet vernal grass. Trees that produce allergenic pollen include oak, ash, elm, hickory, pecan, box elder, and mountain cedar. People with a pollen allergy may at first suspect they have a summer cold - but the "cold" lingers on. For any respiratory illness that lasts longer than a week or two, it is important to see a doctor. When it appears that the symptoms are caused by an allergy, the patient should see a physician who understands the diagnosis and treatment of allergies. If the patient's medical history indicates that the symptoms recur at the same time each year, the physician will work under the hypothesis that a seasonal allergen like pollen is involved. To find out which types of pollen are responsible, skin testing may be recommended using pollens commonly found in the local area. A diluted extract of each kind of pollen is applied to a scratch or puncture made on the patient's arm or back or injected under the patient's skin. With a positive reaction, a small, raised, reddened area with a surrounding flush (called a wheal and flare) will appear at the test site. The size of the wheal can provide the physician with an important reaction diagnostic clue, but a positive reaction does not prove that a particular pollen is the cause of a patient's symptoms. 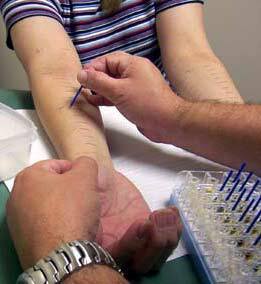 Immunotherapy or injection treatments (commonly called allergy shots). Although no cure for pollen allergy has yet been found, one of these strategies or a combination of them can provide various degrees of relief from allergy symptoms. Remain indoors when the outdoor pollen levels are highest. Sunny, and windy days can be especially troublesome. Avoid intense outdoor activities, such as exercise or strenuous work, during the early morning and late afternoon hours when pollen counts are highest. If persons with pollen allergy must work outdoors, they can wear a pollen and dust mask. Face masks are designed to filter pollen out of the air reaching person's nasal passages. As another approach, some people take their vacations at the height of the expected pollinating period and choose a location where such exposure would be minimal. The seashore, for example, may be an effective retreat for many with pollen allergies. Wash your hair before going to bed to avoid getting pollen on your pillow. Use a clothes dryer instead of hanging the wash outside, where it acts as a filter trap for pollen. Air cleaners. Use of air conditioners and purifires inside the home or in a car can be quite helpful in reducing pollen levels. Make sure to clean and replace your air conditioner and air cleaner filters regularly. Also effective are various types of air-filtering devices, which can be added to the heating and cooling systems in the home. You can find more hints in the article on minimizing your exposure to pollen. Antihistamines. As the name indicates, an antihistamine counters the effects of histamine, which contributes to the allergy symptoms. For many years, antihistamines have proven useful in relieving sneezing and itching in the nose, throat, and eyes and in reducing nasal swelling and drainage. Unfortunately, many people who take antihistamines experience some distressing side effects: drowsiness and loss of alertness and coordination. Nasal Decongestants. Over-the-counter products containing decongestants can be helpful in relieving blocked nasal passages. These drugs constrict the blood vessels in nasal tissue, lessening swelling and mucus production. Because these drugs can raise blood pressure, increase the heart rate, and cause nervousness in some people, persons with allergies should check with their doctors before using decongestants. People with allergic rhinitis should avoid using decongestant nasal sprays because frequent or prolonged use can lead to a "rebound phenomenon", in which the initial effect of shrinking the nasal passages is followed by increased swelling and congestion. When this occurs, a person often will use the spray in higher doses, or more frequently, in an attempt to get relief from congestion. Instead of improving nasal congestion, however, such use of nasal sprays only intensifies the problem. Corticosteroids. Until recently, corticosteroids, although very effective in controlling allergic disorders, were not widely used for pollen allergy because their prolonged use can result in serious side effects. Corticosteroids relieve the symptoms of pollen allergy by reducing nasal inflammation and inhibiting mucus production. Locally active steroids are now available as nasal sprays in measured-dose spray bottles. When used this way, the drug affects only the nasal passages rather than the entire body. The side effects, which are minimal when the spray is used in recommended doses, can include nasal burning and dryness and a sore throat. Cromolyn sodium. Another effective agent that is available by prescription as a nasal solution. Unlike antihistamines or steroids, cromolyn sodium is believed to control allergic symptoms by preventing histamine release. In clinical trials, cromolyn sodium has been proven safe and effective and, in contrast to some other allergy medications, appears to cause no drowsiness. Unlike antihistamines and decongestants, corticosteroid nasal sprays and cromolyn sodium nasal solutions must be used for several days to weeks before there is any noticeable reduction in symptoms. Nasal Irrigation is a safe and effective practice that can (and probably should) be performed daily. Also called jala neti, it began as an ancient practice in India and is now practiced worldwide. Nasal irrigation uses salt water to flush bacteria and dried mucus out of the nose and sinuses. Saline sprays look very much like nasal decongestant sprays, but instead of medication they contain a specially mixed saline solution. The solution moisturizes dry and irritated mucous membranes. Saline sprays do not flush out the nasal and sinus passages as much as a full irrigation. Steam inhalation is often used to break up mucus and reduce congestion. Steam can soothe and moisturize irritated nasal and sinus membranes, and unlike nasal irrigation it also helps soothe sore throats and chest congestion. Aromatherapy is often used with steam inhalation to provide extra relief. Aromatherapy takes essential oils (usually a combination of eucalyptus, lavender, peppermint, tea tree oil, and rosemary) and uses them to produce a soothing vapor that helps to alleviate allergy symptoms. While you can mix your own aromatherapy oils, it is recommended that you buy a product with the oils already mixed for you, that way you can ensure it having the proper balance of oils. Immunotherapy is not without problems. It can be expensive, and may require months before improvement is apparent. Further, it does not work well for some people and, if the size of the dose or frequency of shots is not carefully monitored, the injections can cause allergic reactions. These reactions can be quite mild - redness and swelling at the site of the injection - or potentially serious systemic reactions such as hives, generalized swelling, or shock.